Beer Coolers weren’t Cool, until now! I hate the term “Beer Cooler” (and you probably do too); it reminds me of being a freshman and all of the terrible drink choices people made when they first started drinking…especially all of you girly girls out there. 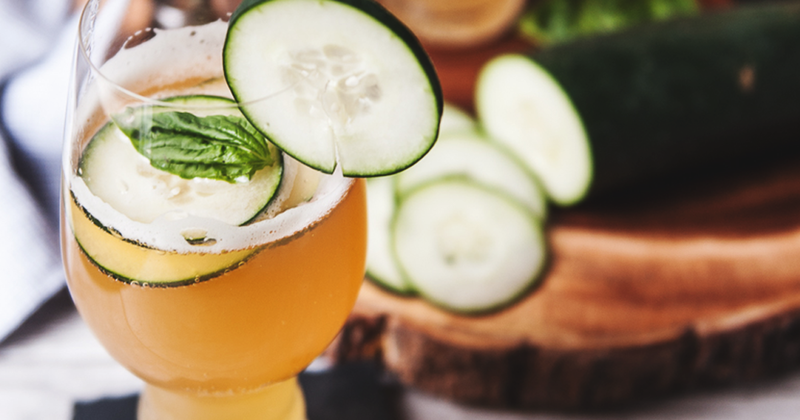 So, while this recipe is technically a “cooler”, we’re calling it a beer cocktail to save face; if you need to “masc’ this drink up”, then skip the steps and return to drinking your regularly-scheduled generic adjunct lager. You’re suggesting turning a good IPA into a beer cocktail?!?!? If you’re a fan of IPAs, you might scoff at the idea of turning an IPA into a cocktail, but you may also appreciate the novelty of an IPA mixed drink over an iceberg, bulldog, chelada or red eye…AAAAND this cocktail will still carry over the great flavours you liked about IPAs in the first place! NOTE: If you use lemon flavored sparkling water, or any other soda that is unsweetened, make sure to compensate for the lack of sweetness with about 1/2 ounce of simple syrup or agave. Add the vodka, basil, cucumbers and sparking lemonade to a shaker half filled with ice. Shake several times, pour into an IPA glass. NOTE: If you’re making a bunch of these over the afternoon, scale this recipe accordingly and have your cucumber-basil-vodka ingredients premixed and set aside for quick cocktailing when you need them. Pour beer into the glass, gently stir. What is the next best thing to drinking a Phillips’ Longboat Chocolate Porter? Eating it!